While Jews had been living in Pine Bluff since the 1840s, it took them several years before they began to pray together. Starting in 1859, they met in private homes on the high holidays. Services were led by lay readers Aaron Reinach and Max Weil. Right after the Civil War, Pine Bluff Jews began to organize a congregation. In 1866, they formed Anshe Emeth (Men of Truth) and purchased land for a synagogue. David Aschaffenberg was the first president of the congregation. In October of that year, they held a cornerstone laying ceremony at the corner of 3rd Avenue and Laurel Street. Pine Bluff’s mayor and several local Christian ministers spoke at the ceremony. The following year, the group received an official charter from the state, making Anshe Emeth the first chartered congregation in the state. (Little Rock’s B’nai Israel congregation received their charter only five days later). In its early days, Anshe Emeth met in a rented room on Pullen Street while their synagogue was being built. In 1867, their first synagogue was completed. That same year, Anshe Emeth hired their first rabbi, Jacob Bloch, who served the congregation until 1871. Bloch also taught in the newly organized public schools in Pine Bluff to supplement his salary. Since most of the members of Anshe Emeth were German Jews, sermons were given in German until 1874. By 1873, the congregation, now numbering 45 members, had joined the Union of American Hebrew Congregations and embraced Reform Judaism. In the late 1880s, Rabbi Ferdinand Becker started Anshe Emeth’s religious school. In 1870, Mrs. Sam Blumenthal led the way in founding a temple sisterhood. She served as its president for many years. Female members of Anshe Emeth later formed a charity group, called Willing Workers. While the group was originally founded to help Jews in need, it eventually helped everyone. The members of Anshe Emeth were well accepted by the community. Although its cemetery was vandalized in 1876, they had good relations with local churches. Anshe Emeth let several churches use their temple when they were constructing new buildings or just getting started as congregations. 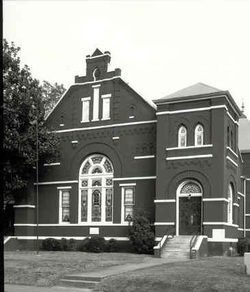 Pine Bluff’s First Christian Church was organized in Anshe Emeth’s synagogue in 1894. Anshe Emeth would hold its annual purim balls at city hall. In the late 19th century, the Jewish community of Pine Bluff and Anshe Emeth experienced tremendous growth. Having outgrown their synagogue, Anshe Emeth built a new, larger brick temple at the corner of 2nd Avenue and Poplar Street in 1902. By 1907, they had 133 members and almost $4000 in annual income. They had 90 children in their religious school by 1917. In the early 20th century, a growing number of Eastern European immigrants settled in Pine Bluff. Wishing to maintain a more traditional religious practice, many of these recent immigrants chose to form their own congregation rather than join the Reform Anshe Emeth. In 1907, a group of 28 Jews founded an Orthodox congregation called B’nai Israel (Sons of Israel). H. Bram was its first president. For many years, the small congregation met in a room next to a tailor’s shop for weekly lay-led Shabbat services. For the high holidays, they would usually hire a visiting rabbi or cantor to lead services, which were held at the local Masonic Hall. Orthodox Jews from around the area would come to Pine Bluff on Rosh Hashanah and Yom Kippur to worship with B’nai Israel. For a few years, B’nai Israel had a full-time rabbi, but for most of its history, members of the congregation led services. Once the supply of Jewish immigrants from Eastern Europe was cut off by new federal immigration laws in the 1920s, B’nai Israel began to decline. As its members assimilated to life in Pine Bluff, many moved over to Anshe Emeth, finding Reform Judaism a better fit for their new lifestyle. Several of the founder’s children joined Anshe Emeth once they reached adulthood. By the 1930s, many of B’nai Israel’s members also belonged to the Reform congregation. Weekly services were discontinued, though they still held separate Orthodox services for the high holidays until 1950, when B’nai Israel officially disbanded. Its remaining members joined Anshe Emeth. Pine Bluff’s Reform congregation had several rabbis over the years. Between 1867 and 1967, 19 different rabbis served Anshe Emeth. A few were rather controversial. Rabbi Ephraim Frisch was an outspoken critic of Christian displays in public spaces. When Arkansas’ governor used Christian references in his annual Thanksgiving message, Rabbi Frisch strongly criticized him. Frisch was also a liberal on the race issue, and befriended Isaac Fischer, a controversial local black leader and educator. Frisch left Pine Bluff in 1912, after eight years as the rabbi at Anshe Emeth. In 1919, Rabbi Leonard Rothstein came to Pine Bluff from his previous pulpit in Alexandria, Louisiana. Rothstein instituted several changes that upset a segment of the congregation. He instituted open seating, replacing the old system in which members would buy particular pews, and allowed women to be full members and serve on the board. Rothstein was also outspoken on social issues, strongly criticizing the Pine Bluff school board for letting a Ku Klux Klan representative speak at a local high school. Rothstein’s changes and outspokenness split the congregation. In 1921, 58 members broke away and founded a new Reform congregation, Temple Israel. Some of Anshe Emeth’s leading members were part of this breakaway group. The schism split families as well. In once instance, a husband joined Temple Israel while his wife remained a member at Anshe Emeth. Temple Israel met at the local Shrine Temple and the Harmony Club, a Jewish social club in Pine Bluff. Although Temple Israel didn’t have a synagogue of their own, the group was able to hire a rabbi, Louis Brav. Rabbi Rothstein left Pine Bluff in 1923 for a pulpit in St. Paul, Minnesota, blaming his exit on the “narrowness and blindness of the community at large.” In 1924, Brav left Pine Bluff for a pulpit in Corsicana, Texas. During the schism, Anshe Emeth had suffered great financial hardship, as many of their well-heeled members had joined the new temple. But by 1924, neither congregation had a rabbi, so the old disputes were resolved and the two groups reunited as Anshe Emeth. Rabbi Mayer Lippman came to Pine Bluff to lead the reunited congregation. In 1925, they had 110 contributing members. Anshe Emeth retained its membership over the next twenty years. In 1945, they still had 100 members. But after World War II, the Jewish community of Pine Bluff began to decline. By the early 1960s, Anshe Emeth decided that it no longer needed its large brick synagogue located in downtown Pine Bluff. In 1961, they purchased a lot on the corner of 40th and Hickory Streets for a new synagogue. Six years later, the congregation had finally raised the necessary money and the new temple was built. Their new synagogue was much smaller than their old building and was located in the part of town where most members now lived. At the time of the dedication, Anshe Emeth had about 85 contributing members, though many were elderly. 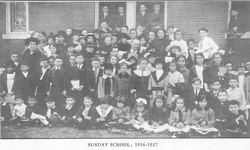 The congregation only had 26 children in their religious school at the time. Rabbi Morris Clark served Anshe Emeth from 1927 to 1949. After Clark left, the congregation was served by seven different spiritual leaders over the next twenty years. Rabbi Leslie Sertes came in 1970 and stayed until the mid-1980s. Sertes was the last full-time rabbi at Anshe Emeth. Since he left, the congregation has relied on student rabbis from Hebrew Union College. number of farmers around Pine Bluff, which meant that many Jewish-owned businesses were losing much of their customer base. Several Jewish-owned stores in Pine Bluff closed in the last several decades. 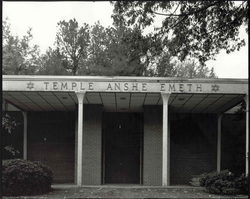 By 1985, Anshe Emeth had only 69 members. 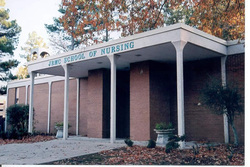 In 2003, the congregation decided to sell their synagogue to a local hospital who has converted it to a nursing school. Without a permanent building, the congregation now meets in a small chapel at the First Presbyterian Church once a month. Only fifteen members still belong to Anshe Emeth.